important and carefull: 13. double confirm the bpi-m64 board red light is off, 14. carefull and press the tiny U-boot button which is located behind ethernet port. 15. make sure pressing and holding the U-boot button, dont release! 16. now use another hand and press power button, hold the power button for 1-2 seconds until u see the red light is on, make sure your hands do not touch any circuit, and another hand still pressing the U-boot button 17. 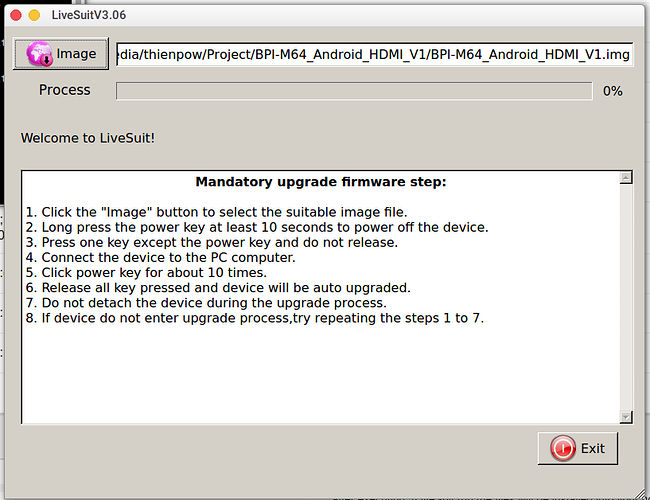 Until you see the LiveSuit pop up a dialog asking you to format and flash… then can release all button. 18. click yes to proceed flashing Android to eMMC. if you fail to press u-boot button and power button correctly… you dont need to unplug anything… just press the power button for 10 seconds to power off, and try the uboot+power on again. Sorry, I don´t understand the purpose of the linked download, the program doesn´t install drivers, doesn´t work. All characters are in chinese, I dont understand anything. It looks that is for IOS products not for BPI. The MTP USB drivers problem and BPI M64 Android drivers problem still continue in Windows 7, with and without installing linked program. Which version of ubuntu did you use? I tried ubuntu images on here. 2017-8-13, 2017-8-14, 2018-1-5. but all failed. ./LiveSuit.run execution has an warning ( version ‘-’ has bad syntax…).